China’s continued rise as a global power, the increasing economic and strategic weight of East Asia and the emergence over time of India as a global power are key trends influencing the Indian Ocean’s development as an area of increasing strategic significance. In aggregate, these trends are shaping the emergence of the Indo-Pacific as a single strategic arc. Elsewhere in the document, we are told that “Growing trade, investment and energy flows across this broader region are strengthening economic and security interdependencies.” One key word is “interdependencies”. In my opinion, it reflects the reality that only recently and by necessity a U.S. administration focused on bilateral negotiations, or one-on-one “deals” as favored by Donald Trump, started to recognize. There are other factors motivating investments in the region. On the positive side, the regional players, after the devastating 2004 tsunami, discussed ways to respond to catastrophes and improve communications. There has been also talks and initiatives about fighting piracy off Somalia and securing the transportation of Chinese products to Europe with China sending its Navy ships to the region and later opening a base in Djibouti. It seems, therefore, that the U.S. cannot claim it has, with its allies, the monopoly of securing free maritime trade routes. China’s plans to open multiple naval bases close to India, in Pakistan, Sri Lanka, etc., are, however, a matter of concern. There is no doubt that Beijing is a major player in the Indo-Pacific. As China’s influence grows, concerns are being expressed by other countries, focusing not only on China’s trade ambitions in general and projection of military power in the South China Sea, but more specifically on the Belt and Road initiative (BRI). French medias sometimes translate Belt and Road Initiative as “Nouvelle Route de la Soie” when it should be “Routes” as a variety of development corridors are planned or being established between China, Europe and Africa, including roads, railways and maritime routes with the necessary port infrastructures. We can also mention that Belt refers to the ancient Silk Road and Road to sea lanes including the ancient maritime silk road. It is an ambitious foreign policy launched in 2013 under the name “one belt, one road”. 69 countries have signed up and China is now spending more than $100 billion a year in investments, mainly infrastructure ones. China needs to attain a new level of development and the BRI helps to that effect by serving the country’s economic interests. Both in terms of importations and exportations, better and faster transportation means lower costs and lower prices. If the BRI opens new markets for China, it also helps secure food for delivery to a growing Chinese population. In an article published on 26 June titled “China’s Belt and Road Initiative paved with risk and red herrings”, the authors explained how common criticisms of the BRI were flawed. However, they point at “empirically supportable objections to the BRI”. Among them are the regional insecurities associated with the projection of military power, both in the South China Sea and in the countries implicated in the BRI eager to see their debts forgiven in exchange for equity in strategic infrastructures control, such as ports and consequent militarization of the region. Another issue is that if the outlines of the initiative are clear, there are no default rules or procedures concerning loans. As the authors say “case-by-case bilateral negotiations with China seem to be the default option” when rules and transparency are most needed with a project on such a large scale. The U.S. government tends naturally to focus on the perceived negative aspects of the BRI, but the BRI might have a positive impact on sustainable development and the natural environment as the Guidance on Promoting Green Belt and Road published by the Chinese ministries of Foreign Affairs and Environment in May 2017 shows. Since the beginning of Donald Trump administration, isolationism and the quasi-religious fervor with which the America First movement has been used as a guide for trade policies and environmental policies (with the announcement the U.S. would withdraw from the Paris Agreement on climate change) have antagonized Washington’s allies. I anticipate therefore that this document will be used in promoting Chinese green technologies in the dozens of countries implicated in the BRI. As boycott campaigns targeting foreign products and anti-foreigner protests have shown, Beijing is willing and able to orchestrate such events domestically and put a break to them when and where necessary, relying on contemporary history to exacerbate nationalistic feelings. However, those tactics are not limited to Continental China and its citizens. As Amy Qin explained in the August 5, 2018 issue of the New York Times online, “China has become increasingly assertive in its efforts to appeal to the vast Chinese diaspora to serve the country’s national interests and gain influence abroad.” She gave us as examples the mobilization of local groups in Western countries in support of Chinese policies regarding Taiwan or Tibet. Should it be surprising then that countries with an important ethnic Chinese population become suspicious of any attempt by Beijing to promote Chinese identity and culture based on blood, or when Xi Jinping talks about “Chinese sons and daughters at home and abroad” blurring as Amy Qin explained, the distinction between nationality and ethnicity? If the U.S. is not talking about a fifth column, it is nonetheless increasingly looking for potential spies. Similarly, Donald Trump argues that China is stealing U.S. intellectual properties to justify the opening of a trade war. Fortunately, other less destructive tools are being put to work to counter the growing influence of China in the Indo-Pacific. On the diplomatic front, the U.S. is holding so-called “2+2 meetings” at the Foreign Affairs and Defense minister level with Australia, Japan and India. In addition, the U.S. Secretary of State Mike Pompeo delivered a speech titled “America’s Indo-Pacific Economic Vision” on 30 July 2018 in Washington in which he announced plans to increase U.S. public and private investments. The $113 million mentioned pale in comparison to the hundred billion of dollars being invested by China as part of its BRI. However, this engagement would serve as a catalyst for more private U.S. investments in the region, which in turn would lead to more clarity and “honesty” regarding contracts and deals than what could be expected from Beijing. It also helps showing other countries that isolationism is not the only policy chosen by Washington. In their May 20, 2018 article published in The National Interest “How China Plans to Dominate the Global Economy: Copy America”, Patrick Mendis and Joey Wang gave us a lesson in history, telling us that “the infringement of intellectual property will fuel economic development” until, in the words of China scholar Frederick Abbott“the country reaches the point where IPR protection becomes economically advantageous to a sufficiently strong set of domestically vested interests.” The authors also reminded us that both the U.S. and Japan went through the same process. Also, as an observer of American politics and history, I see parallels, in this Trump era, between the deep if not openly expressed fear of the White man to lose his dominant status to expanding minorities, domestically, and the fear of seeing America lose his position in the world, an event or fall that would negate what its citizens had been made to believe under the ideology of American exceptionalism. As we have seen previously, there is also in China a form of exceptionalism instrumentalised by the government in its efforts to rally the support of the Chinese diaspora. However, as the U.S. reacts to fear and a possible loss of status, China is developing a positive long-term strategy of making both its huaqiao citizens abroad and huaren ethnic “sons and daughters” proud and united. If the Chinese initiative might remind us of the MAGA (Make America Great Again) Donald Trump’s campaign slogan, there is no doubt that behind the latest, fear of uncertainty and other negative and divisive feelings are brewing. We also cannot ignore the fact that Donald Trump’s message is addressed to and received as such by less than 50 % of the U.S. population. From a European humanistic perspective, it is difficult to find any merit in the kind of nationalism expressed by both the Chinese and American powers that be, where exceptionalism, military might and dominance are used a benchmark for greatness. However, Chinese President Xi Jinping, in a major speech on 23 June 2018 clarified China’s major country diplomacy addressing two key themes: “…focusing on realizing Chinese nation’s rejuvenation and promoting human progress, and making contributions to the building of a community with a shared future for humanity.” It is to be seen if the U.S. have been or will be receptive to this long-term vision. However, even if the issues of human rights and “debtbook diplomacy” keep being debated, Europe will see in this effort the recognition by China of the importance of a multipolar, interconnected world, and one more illustration of the position adopted by China both in a phone call to French President Emmanuel Macron in May 2017, concerning the Paris Agreement, and at the Boao Forum for Asia about globalization and free trade in April 2018. 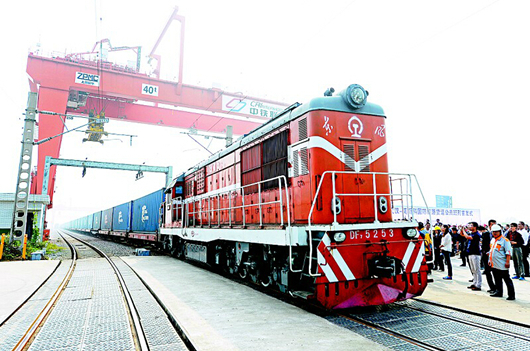 Photo: Chinese freight train from Wuhan to Moscow, Hubei Govt. 前 前の投稿: China As Seen Through The Eyes of the US Indo-Pacific Strategy. 次ページへ 次の投稿: VietJet Aims High.